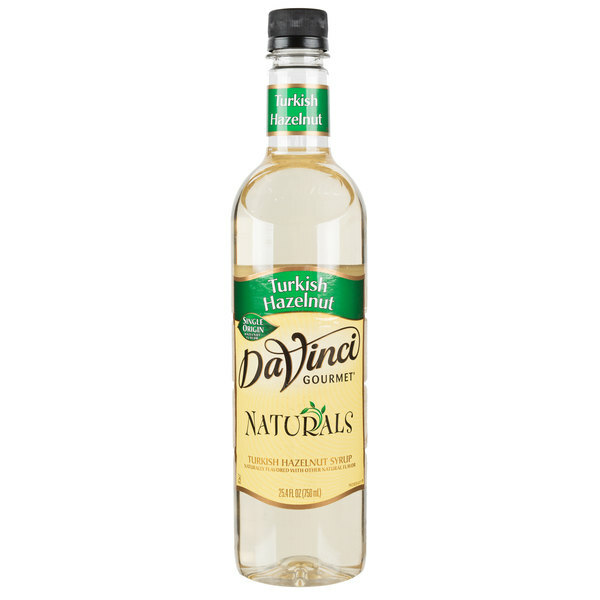 DaVinci Gourmet all natural flavoring syrups, like this Turkish hazelnut syrup, are naturally delicious, providing consistent quality flavor without the artificial flavors, colors, or preservatives! Made with pure cane sugar, this flavoring syrup is perfect for adding sweetness to your signature hot or iced coffee and dessert drinks. Since it is shelf stable, you can proudly display this all-natural product along your bar or counter. 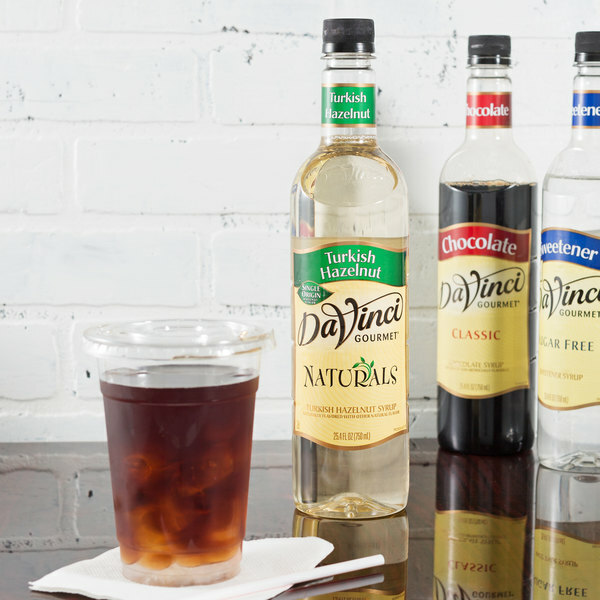 Add intensely nutty flavor to any drink with DaVinci Gourmet Turkish hazelnut all natural coffee flavoring syrup! This flavorful, sweet syrup has the taste of hazelnuts native to Turkey, toasted and prepared to perfection. Bring this flavor to your specialty coffees, or drizzle on desserts with delicious results. One splash of flavoring syrup goes a long way, and flavored beverages made from this flavoring syrup enhance your menu with new and appealing, all-natural items! This user-friendly plastic bottle is easy for your baristas and restaurant staff to handle. Sold in gourmet coffee shops, specialty food stores, food service outlets, and grocery stores, DaVinci Gourmet products, like this all-natural Turkish hazelnut syrup, have a long history of commitment to quality and superior taste. The Turkish hazelnut syrup is really top notch and has the best hazelnut taste ever. A great and supreme way to make creamy cappuccinos that taste superb. I had never tried this flavoring syrup in the past, but once I tried it in my coffee, I was hooked. It had a strong flavor to it that made my coffee so much better. You really need to give this a try, trust me! This is a delicious hazelnut syrup and we love how few ingredients it has. Finding an all natural syrup was important to us and this fit the bill perfectly! I can find this flavor only in here. Naturals series attracts customers. They are always asking what is the difference between regular hazelnut and this one! Make them feel special, buy it from webstaurantstore! It's absolutely amazing, I love hazelnut, if I wasn't in the mood for coffee or encountered someone who wanted a drink made because they liked the way I made em, but were sensitive to caffeine, I'd just mix this and their choice of milk, they said it tasted like "the leftover milk from Cheerio's!" and I actually agree. It's really good and oddly enough blends well with most things, primarily toffee, coffee, chocolate and vanilla. This syrup tastes great, like actual hazelnut and not like a bunch of chemicals. I love it in my morning coffee. I, personally, think this natural syrup tastes better than other conventional syrups. DaVinci Gourmet Turkish Hazelnut all natural flavoring is delicious! It has no added coloring and uses pure cane sugar. My husband prefers this over any other hazelnut coffee syrup. Great flavor all by itself, but also pairs well with dark and white chocolates as well. We have a lot of customers request this in brewed coffee and teas too. By far the best hazelnut syrup I've used. It gives a full nutty aroma and flavor without being cloying or over-sweetening drinks. 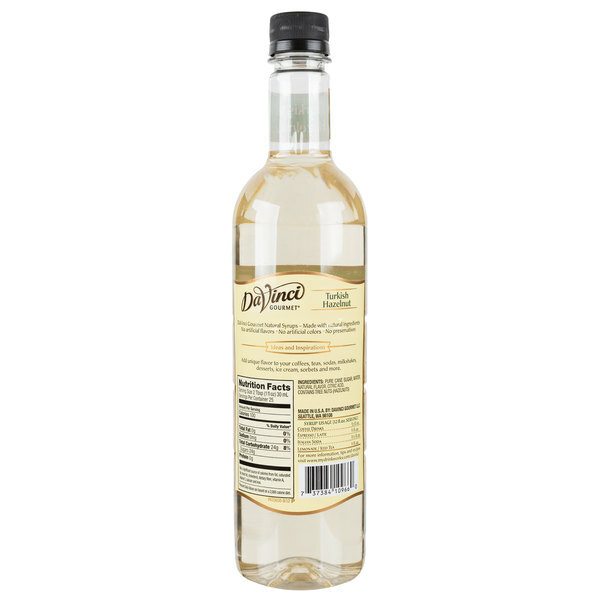 Works for hazelnut liqueur in mocktails, boozy shakes, or in coffee or steamers. THIS IS THE BEST HAZELNUT SYRUP on the market. It is so delicious and has a true hazelnut flavor. As with all the all natural flavors from DaVinci, this one is amazing! good quality, fast delivery. would buy again. The Syrup is great for iced coffees, has a great flavor. Very afforable price. I bought two flavors to try. I wanted to have Ice Coffee on hand and these tasted great. Just made hot coffee, added Ice and the syrup- very pleased with the flavors. Absolutely love the syrups. All three brands are good. I especially like the sugar free, no after taste and very flavorful. All my guest love having coffee at my house. I just ordered 14 various bottles of this coffee flavoring syrup. It is delicious in coffee to sweeten it and to give it flavor. I can't wait to try more flavors and they have a large variety from which to choose. Great item at a great price.Use it with coffee drinks for a great non-alcoholic drink. Shipping is fast and easy. I would recommend this product. We Love the Coffee flavors and you can't beat the price! It's like having your own Dunkin at home! Would reccomend to any coffee Lover. We use this syrup in our coffee and to make vanilla cokes. The flavor is delicious! We've recommended the product and the website to friends, and we'll be ordering more!